Eatonton Main Street has been designated as an accredited Main Street America program for meeting rigorous performance standards set by the National Main Street Center. Each year, the National Main Street Center and its Coordinating Program partners announce the list of accredited Main Street America programs in recognition of their exemplary commitment to preservation-based economic development and community revitalization through the Main Street Approach. 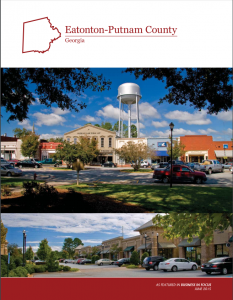 The organization’s performance is annually evaluated by the Georgia Main Street Program, which works in partnership with the National Main Street Center to identify the local programs that meet ten performance standards. Evaluation criteria determines the communities that are building comprehensive and sustainable revitalization efforts and include standards, such as fostering strong public-private partnerships, securing an operating budget, tracking programmatic progress and actively preserving historic buildings. In 2016, Eatonton Main Street welcomed the opening of new retail, new restaurants and a new event facility in the downtown. Eatonton Main Street events have seen an increase in attendance from both visitors and vendors. The year ended with a Christmas Parade in which entrants highlighted the best of what Putnam County has to offer. Through the use of ideas and innovation, Eatonton Main Street created a downtown ambiance which captured the imagination of the public and retailers alike. The purpose of Eatonton Mainstreet is to work alongside local officials, public & private sponsors and volunteers in order to make Eatonton’s downtown the best it can be through economic vitality, organization, promotions and design. The mission of Eatonton Main Street is to encourage preservation of Eatonton’s historic and cultural character through awareness, business development, events, and by using Main Street’s Four Point Approach. Eatonton Main Street’s vision is of a Downtown that has small town charm with successful businesses and happy customers. Eatonton Main Street will encourage sustainable growth, tourism, revitalization and preservation of traditional architecture to enhance downtown. Main Street America is a program of the nonprofit National Main Street Center, a subsidiary of the National Trust for Historic Preservation.